After 40 years of struggle, school choice is now at the center of the debate over school reform in America, and it is of primary importance that the public understand the facts-and avoid the myths-surrounding this issue. This three-part primer is designed to educate and inform citizens about all aspects of school choice and equip them to participate in the debate as fully informed members of their communities. 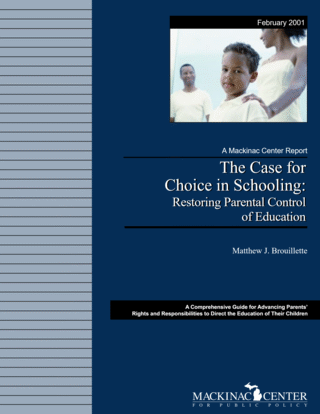 The report contains a historical overview of tax-funded schooling, demonstrates the failure of many popular reforms of the past and present, explains the various types of school choice, identifies the barriers to education reform, dispels myths surrounding school choice, and outlines strategic plans parents and other concerned citizens can follow to advance the cause of greater school choice.